The SA-200 (also referred to as the SA-200-F) is for applications where it is difficult to achieve the optimum spacing using the SA-100. The SA-200 gives the same length spectrum at half the spacing compared with the SA-100 (link). 1. 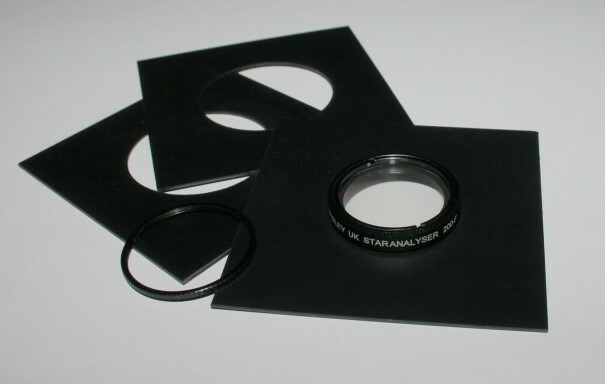 In applications with close-coupled filter wheels, the distance from the camera to the Star Analyser is generally too short for the SA-100 to perform well. W hen mounted very near to the sensor, the additional dispersion of the SA-200 is more likely to yield the dispersion necessary for good results. 2. There is an optional mounting kit (see below) for the SA-200, making it fit on a wider range of filter wheels than the SA-100. 3. The SA-200 has a significantly lower profile (7.7 mm total height compared with 11.2 mm for the SA-100) which allows it to be mounted in filter wheels designed for 1.25 inch filters without risk of fouling the wheel housing. (Note that the low profile design means that, unlike the SA-100, there is no thread available above the grating to screw on other accessories.) The SA-200 can be aligned with the camera sensor and held in the correct orientation for example with plumber’s Teflon tape (PTFE) on the thread or a spot of hot melt adhesive. 4. On telescopes with a larger aperture and a longer focal length, the dispersion of the SA-100 can be insufficient to achieve optimal results. The SA-200 produces longer spectra, making it easier to find settings which give satisfactory results with a larger camera sensor. 5. 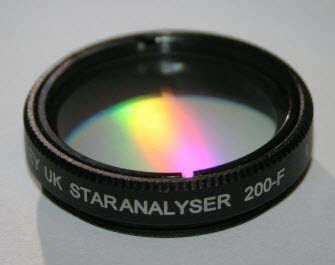 When using the Star Analyser as an objective grating on the front of a DSLR camera lens, the SA-200 is optimized for the typical short focal length zoom lenses found as standard on most DSLRs. The SA-100 will give excellent results too, however it needs a telephoto lens to take full advantage of the additional resolution of a DSLR. To determine whether the SA-100 or the SA-200 would be a better fit for your setup, see our on-line calculator: link. Mounting Kit: one carrier, one threaded collar, and two spacer plates. Before ordering the Mounting Kit, please check your particular model of filter wheel to ensure there is sufficient clearance to accommodate the 7.7 mm height of the SA200. 2. Mount the SA200 through the pre-punched hole. Rotate it in-place until your spectrum is horizontal on your sensor with the blue end of the spectrum to the left. 3. Fix the grating in position using the supplied threaded collar. 4. The mounting kit comes with two additional plates that can be used as spacers. 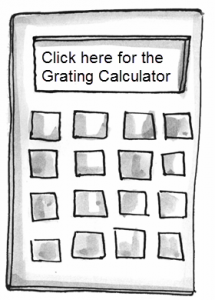 They’re made of the same material as the carrier plate and are supplied pre-punched with over-sized holes. You can mount these above or below the carrier plate as required to increase the total thickness and place the SA200 at the optimum height to clear the housing on your filter wheel. Tip: To ensure a good fit when trimming the plates to size, first make a template using a (weak) adhesive-backed label paper and check that it fits correctly in the filter wheel. Then stick the label centrally onto the plate and trim around it. If necessary for the clearances in your particular filter wheel, it is also feasible for you to fabricate a carrier which lowers the position of the SA200 below that shown in the above schematic. You can build up your material to the desired thickness using polystyrene and cement. 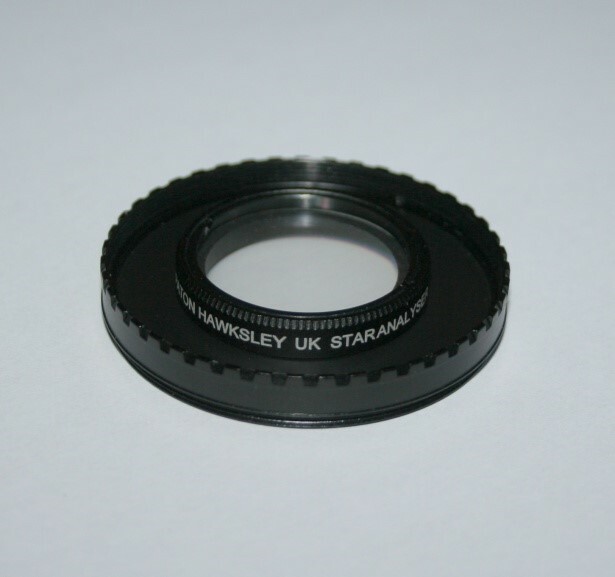 Remember that you need 7.7 mm free space in your filter wheel to accommodate the height of the SA200. Because you can easily trim the mounting plate, our kit can be adapted for use in a variety of mechanical configurations. 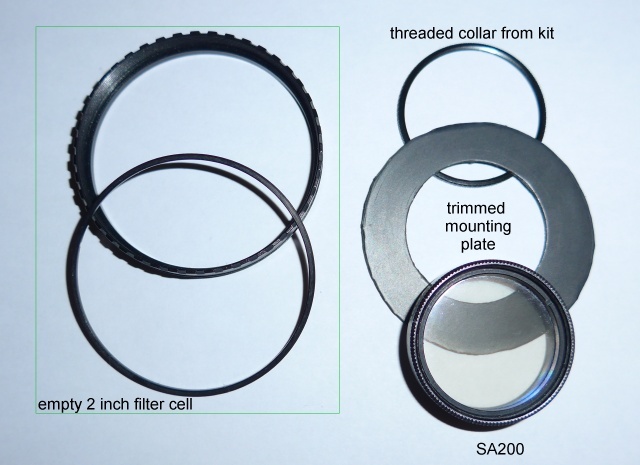 For example, if you have a blank 2″ filter cell, trim our kit’s mounting plate to the size of a 2″ filter as shown on the right below. Then secure the SA200 in the mounting plate using the mounting kit’s collar. Finally, install the assembly in your empty filter cell. Questions? Use our contact form to discuss them with our Help Desk experts: link.